A 40-year-old woman presented with complaints of multiple, tender, skin-colored raised lesions over right upper back and arm for 8 years. There was a history of pain in lesions, which aggravated during winters and on pressure. 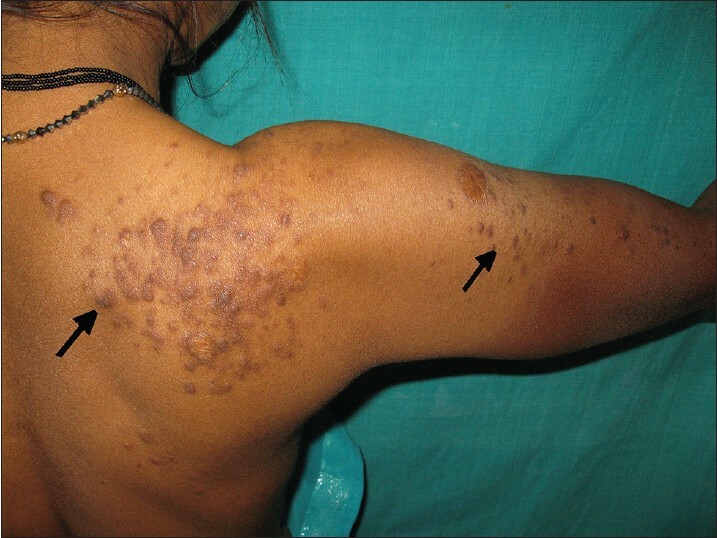 On examination, multiple firm, tender, skin-colored smooth-surfaced, papulonodular lesions measuring 1-3 cm in size in a segmental pattern were present over right upper back extending up to right shoulder and arm [Figure 1]. Systemic examination was normal. Routine investigations, including complete blood count, liver and renal function tests, and chest radiographs were normal. Pelvis ultrasonography showed enlarged uterus with multiple hypoechogenic masses. 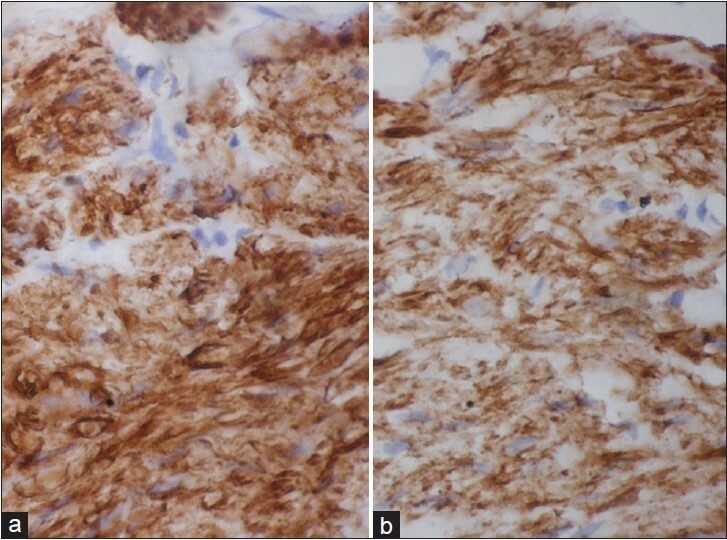 Histopathologic examination of an excisional biopsy from a lesion was carried out [Figure 2]a and b. Immunohistochemical staining for actin and desmin were carried out [Figure 3]. Reed's syndrome (Type II segmental cutaneous leiomyomas with uterine leiomyomas). The diagnosis of Reed's syndrome was made on the basis of clinical, histopathologic findings and special staining. Histopathologic examination showed nonepithelial neoplasm involving most of the reticular dermis. Neoplastic cells were arranged in closely spaced fascicles with cells showing elongated eel-like nuclei. Immunohistochemical staining was positive for smooth muscle actin and muscle-specific intermediate filament desmin. Leiomyomas are benign smooth muscle tumors clinically presenting as solitary or multiple, occasionally painful, flesh-colored papules and/or nodules. Cutaneous leiomyomas comprise 75% of the extrauterine neoplasms. There are mainly 3 types of leiomyomas, including pilar, genital, and angioleiomyomas. Pilar leiomyoma is the most common type of cutaneous leiomyoma. Although the exact etiopathogenesis of cutaneous leiomyomas is unknown, a few recent studies have demonstrated the role of a tumor suppressor gene encoding fumarate hydratase in the pathogenesis. Lesions on trunk are multiple and can be segmental, disseminated, or zosteriform in distribution, whereas those on extremities are usually solitary. In Type I segmental leiomyomas, heterozygosity of postzygotic mutations leads to segmental skin lesions and in Type II segmental leiomyomas, postzygotic mutational events occur in heterozygous embryo leading to loss of heterozygosity, which in turn leads to predominantly segmental leiomyomas along with the normal phenotype of the disease. The most common presentation includes reddish brown firm papulonodules, which may be discrete or coalescing to form plaques. The extensor aspect of extremities and trunk being the most common sites. Lesions are often painful and there is increased sensitivity to cold, pressure, or emotional stimuli. Pressure of the tumor on local nerve fibers and contraction of smooth muscle fibers have been thought to play a role. Histopathology characteristically shows poorly circumscribed proliferation of haphazardly arranged smooth muscle cells with eosinophilic cytoplasm, blunt-ended nuclei, and perinuclear halos in cross section. Immunohistochemical staining shows cells expressing smooth muscle actin and muscle-specific intermediate filament desmin, but they stain negatively for S100 and epithelial membrane antigen. Various conditions that have been associated with piloleiomyomas include Reed's syndrome (multiple cutaneous and uterine leiomyomatosis), cluster renal cell carcinoma (hereditary leiomyomatosis and renal cell cancer), and polycythemia. The predisposition gene for Reed's syndrome has been localized to chromosome 1 q42.3-43 and the gene encoding fumarate hydratase. , Surgical excision is the best modality of treatment for solitary cutaneous piloleiomyomas. Pain may be a significant source of morbidity and various systemic treatments have been tried for pain relief, including calcium channel blockers (nifedipine), phenoxybenzamine, doxazocin, nitroglycerine, gabapentin, and topical analgesics. Carbon dioxide laser therapy, cryotherapy, and electrosurgery have also been tried for ablation. Based on history and clinical examination, differential diagnosis of neurofibroma, leiomyoma, glomus tumor, myofibroma, angiolipoma, and eccrine spiradenoma were made. Histopathology and special staining were carried out for confirmation of the diagnosis. A diagnosis of Reed's syndrome (Type II segmental leiomyoma with uterine leiomyomas) was made based on history, clinical examination, histopathology, and immunohistochemical examination. 1. White LE, Levy RM, Alam M. Neoplasia and hyperplasias of muscular and neural origin. In: Fitzpatrick TB, Wolff K, Goldsmith AL, Gilchrest AB, Paller SA, Leffell JD, editors. Dermatology in general medicine. 7 th ed. New York, NY: McGraw-Hill; 2008. p. 1172-83. 2. Gupta R, Singal A, Pandhi D. Skin-colored nodules in zosteriform pattern. Indian J Dermatol Venereol Leprol 2006;72:81-2. 3. Smith CG, Glaser DA, Leonardi C. Zosteriform multiple leiomyomas. J Am Acad Dermatol 1998;38:272-3. 4. Ragsdale D.B. Tumors with fatty, muscular, osseous and/or cartilaginous differentiation. In: Elder DE, Elenitsas R, Johnson BL, Murphy GF, editors. Lever's Histopathology of the skin. 10 th ed. Philadelphia: Lippincott Williams and Williams; 2009. p. 1057-106. 5. Thompson JA Jr. Therapy for painful cutaneous leiomyomas. J Am Acad Dermatol 1985;13:865-7.